Obesity related conditions cost the NHS £4.2 billion a year and when combined with physical inactivity, it costs the UK economy £20 billion each year. According to the All-Party Commission on Physical Activity, which released its first report in April, 37,000 lives in the UK are cut short due to physical inactivity and today’s generations might have shorter life expectancies than their parents. Physical inactivity is at a pandemic level. In all of human history, we have never been so inactive. This is grim reading and information that is reported almost daily. We now know that only 22% of adults undertake 30 minutes of exercise per week and that inactivity is a burden that we cannot afford to maintain. Obesity is now often referred to as acceptable and being overweight can now be regarded as ‘the norm’. The plus size clothing market is growing as are demands for larger models that reflect today’s sizes. However, speak to someone who is either obese or overweight and they will tell you that they feel neither accepted nor normal. Obesity and, to a lesser extent, physical activity are often at the forefront of the media’s attention, taking the hit for many of society’s ills. The question is, how do we approach obesity and lack of physical activity in a more balanced way? A way that promotes physical activity as key to changing many lifestyles for the better. Have we taken a pause to consider some of the real issues relating to obesity? How people may feel fearful or unable to change lifetime habits. They might be saying that they don’t want to be active because they feel they can’t. Taking that first small step can require a huge amount of determination and belief. 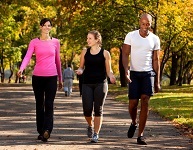 Whilst statistics and facts can help, quantifying solutions to the problem in isolation, like 150 minutes of exercise per week and five, seven or ten portions of fruit and veg a day, can be quite disjointed from the support and personal advice that people need to make that first step to a healthier lifestyle. Facts and figures can help shape future policy, however we need to think of those who are made to feel responsible and who often feel helpless. Fear and shame do not work. Nor does social media’s love of fitspiration images, quotes and proclamations of #noexcuses. People’s reasons for being inactive are real to them. Whether it is a matter of time, juggling their responsibilities, environment or a lack of confidence, people need positive motivation and information relevant to their lifestyles. The idea of playing a sport or exercising is hard to contemplate for many, who feel that they are incapable. Their barriers cannot be overcome by negative comments or pictures of fitness models or athletes. Instead, we need to educate, empathise and enthuse. We need to, as stated in the All-Party Commission on Physical Activity, make being active part of daily life. Something we can easily incorporate into our lives and something that is attainable and achievable. To achieve this we need to provide patients and the general public with basic advice on the benefits of being active; we need to work together to deliver the infrastructure that enables people to travel the short distances to work, schools and shops by more sustainable and active means; to provide opportunities for all to experience and enjoy new activities and to use the country’s volunteers and local heroes to support and inspire. People that many can aspire to and relate to. People that understand and can lead. We need to make active travel a priority when planning new developments and use the legacies of the 2012 Olympics and 2014 Commonwealth Games to drive policy and encourage more to be more active. The organisations that promote walking, running and cycling need to coordinate campaigns and work more closely together, along with physical activity advocates. I am an Ambassador for the Scottish Government’s Fit in ‘14 campaign, which encourages workers to make small changes and to take small steps. It’s my intention to use this approach and some of my other partners to reach more and to engage with more. Who will help celebrate the benefits that being more active can bring and not just the costs of inactivity? We have just marked Physical Activity Awareness Week. Can we follow it by exercising more positive and innovative thinking around our sea of statistics?